The European Parliament on Tuesday voted to approve a controversial new copyright law that hands more power to news publishers and record companies. Social media platforms would have to ensure uploaded content is not in breach of copyright rules. Non-profits and encyclopedias such as Wikipedia will still be able to use data for research and educational purposes. Voss criticized big tech of “governance by shitstorm,” by disseminating disinformation and using money to influence public opinion. European copyright law dates back to 2001, and the European Court of Justice has long been calling for it to be modernised in line with the digital era. EU officials are aware of the fact that a lot of copyrighted material ends up online without the original owners being fairly remunerated. Tuesday’s vote was the culmination of two years of bitter debate. Tech giants, which make huge profits from advertising on content they host, and supporters of a free internet opposed the reform. Critics fear this will lead to the installation of “upload filters.” Publishers and artists were in favor, as they sought a better return on the content they produce. The automated software to detect the copyright-protected content is not compulsory, but likely the only method to process large amounts of data. However, they have a high error rate and could catch and delete legal content. Critics argue this would be a form of online censorship that hampers freedom of speech and creativity. The run up to the vote saw much lobbying and protests by both supporters and opponents of the law. 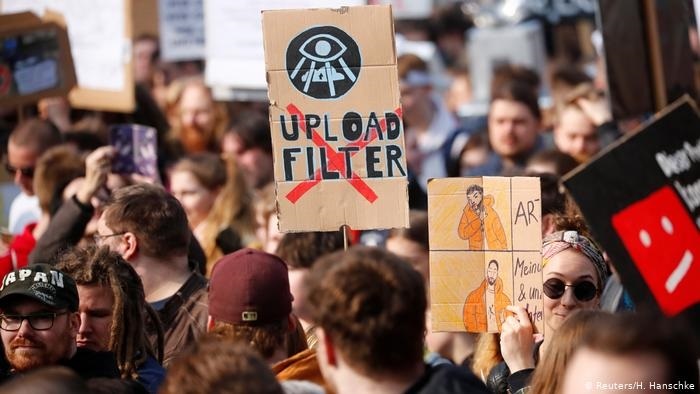 Tens of thousands of people protested in Germany on Saturday under the slogan “Save the internet.” There were similar protests in Austria, Poland and Portugal. Major Polish newspapers on Monday printed blank front pages in an appeal that MEPs adopt the reform. EU member states must now formally approve the legislation. They have, however, already agreed to it in principle.